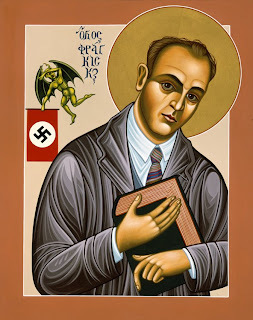 Some might remember the story of Franz Jägerstätter, the Austrian husband, father, farmer and sacristan who was killed by the Nazis at 37 for thrice resisting mandatory conscription into the army of the Third Reich. In June, after decades of Roman study of his cause found it worthy to be deemed martyrdom, Benedict XVI approved Jägerstätter's beatification. And today, on Austria's "National Day," with his widow and 5,000 others in attendance, the liturgy declaring him "Blessed" took place in his hometown of Linz. Jaegerstaetter, an avowed conscientious objector, was executed outside Berlin on Aug. 9, 1943 for treason after his request to be excused from regular army service for religious reasons was denied. The married father of four was posthumously exonerated in 1997 by a Berlin court. About 5,000 faithful and 27 crimson-robed cardinals and bishops from Austria and abroad joined Jaegerstaetter's 94-year-old widow, Franziska, at Friday's ceremony in the northwestern city of Linz, which was broadcast live on national television. "I always prayed to the Lord God that he would let me live to experience this day," she said, surrounded by several dozen family members in a cathedral where a giant black and white portrait of Jaegerstaetter hung over the altar. Cardinal Jose Saraiva Martins, prefect of the Vatican's Congregation for the Causes of Saints, presided over the ceremony for Jaegerstaetter, whom Pope Benedict XVI declared a martyr in June. The beatification gave Austrians a new opportunity to examine "our own wartime past: the war generation, inhumanity, and the terror of the Nazis," Austrian bishops Ludwig Schwarz and Manfred Scheuer said in a statement. "He is a shining example in his fidelity to the claims of his conscience — an advocate of nonviolence and peace," they said, praising Jaegerstaetter for standing up to "the inhuman and godless system of Nazism." "He gave up his life in magnanimous self-denial," the pope wrote in a letter read out by Saraiva Martins. The beatification was held on Austria's National Day holiday, which marks the anniversary of a 1955 law declaring the country to be neutral. In its official biography of Jaegerstaetter, the Diocese of Linz says he had a dream in 1938 warning of the horrors of Hitler's regime to come. "In it, he saw a train carrying innumerable people to perdition, and its meaning was unveiled to him as representing the Nazis," it says. After World War II, two Franciscan nuns brought an urn containing Jaegerstaetter's ashes back to the province of Upper Austria, where he had long been celebrated as a martyr — meaning he died for the church. The official short bio of Jägerstätter cited above can be found here in English.